Editor’s Note: This is exactly, almost word for word, what I’ve been warning people about in my Wes Penre Papers”! See for example, http://wespenre.com/3/paper09-machine-kingdom.htm. Reality catches up with my writing faster than I could ever anticipate. No wonder I felt this intuitive urge to complete the papers ASAP! Wes Penre. Warfare may be an awful thing, but it has a habit of accelerating health technology in ways that are helpful to everyone. For example, in World War II the Allies made significant medical advances in vital areas such as developing antibiotic drugs — which the Germans didn’t possess — and performing lifesaving blood transfusions. Now, however, the military is developing an alarming new interest in the human body and brain. It wants to create armies of mutant soldiers, equipped with unstoppable physical and mental powers. Within 30 years, according to newly released Ministry of Defence papers, British soldiers should be able to lift huge weights, run at high speeds over extreme distances, have infra-red night vision built into their brains, and even be capable of transmitting thoughts by electronically aided telepathy. And this is not just pie-in-the-sky planning. Science is now emerging that may make these army dreams real. A recent Freedom of Information request revealed details of a two-day future-gazing summit by the MoD’s obscure Development Concepts and Doctrine Centre, where military spooks swapped ideas with experts from universities, industry and government. The summit concluded that by 2045, advances in medical technology could create a class of genetically superior humans — rather like the super-powered science fiction characters Wolverine, Storm and Rogue from Marvel Comics. Further details of the military boffins’ thinking are on the internet, in an MoD report titled: Global Strategic Trends Out to 2040. This predicts that advanced drug and genetic technologies will enable armies to reprogram soldiers’ genes, in order to transform them into daunting fighters. 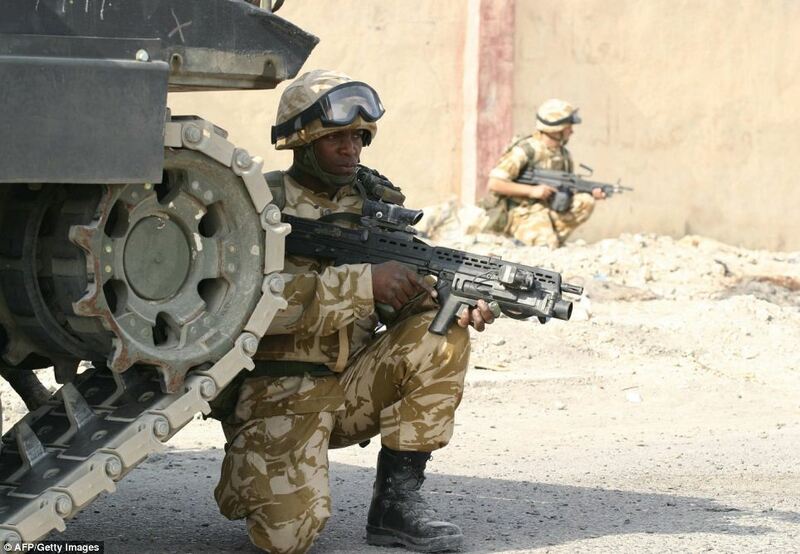 High-tech implants in brains could also help to turn square-bashing squaddies into super-intelligent man-machines. The defence ministry forecasters have given the process a chilling clinical name: ‘human augmentation’. They predict that these brain implants (called ‘cognitive prostheses’) could give solders bionic vision and hearing, as well as towering IQs and total recall. 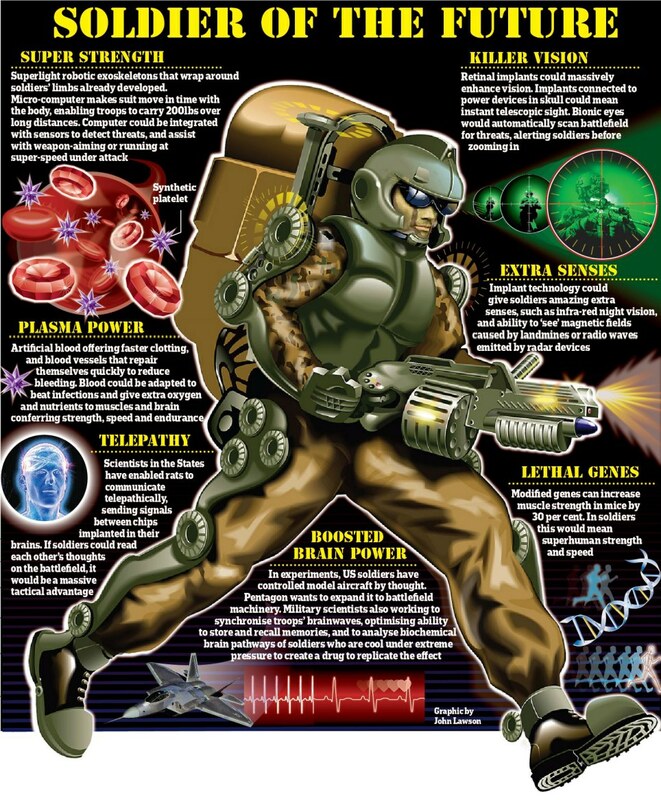 The MoD report adds that such ‘augmented’ soldiers could even have bodies that self-repair wounds, through the use of what it terms ‘regenerative medicine, tissue engineering and artificial immune systems’. It all sounds far too fantastic to be real. But, in fact, some of these outlandish predictions are already turning out to be true. Arms race: In the future a British, currently limited in the amount of equipment he can physically carry, could be given superstrength. For example, America’s Lockheed Martin company is developing an advanced robotic exoskeleton known as the Human Universal Load Carrier, which will enable men to carry massive loads with minimal effort, either on their front or their back. The skeleton is ultralight, highly mobile and attached to the outside of the body with its own titanium legs, which transfer the weight of any load to the ground. Microcomputers sense the soldier’s body movements and enable it to do exactly what he does, whether it is running, lifting or even crawling. Prototype versions are already entering combat trials in Afghanistan. Meanwhile, super-vision came considerably closer last year after pioneering surgery at the John Radcliffe Hospital in Oxford restored some sight to Tim Reddish, a Paralympic swimming champion in his 60s who had been blind for 17 years. The key to the operation’s success was a 3mm microchip with 1,500 light-sensitive cells implanted into each retina and connected by wire to a power unit implanted behind his ear. When light enters the eye and hits the chips, it stimulates light-sensitive cells which send signals to the brain, enabling him to see. Military experts see huge potential. Experiments in the U.S. have shown that implant technology could also give normally sighted soldiers amazing extra senses, such as night vision, and even the ability to see magnetic fields. 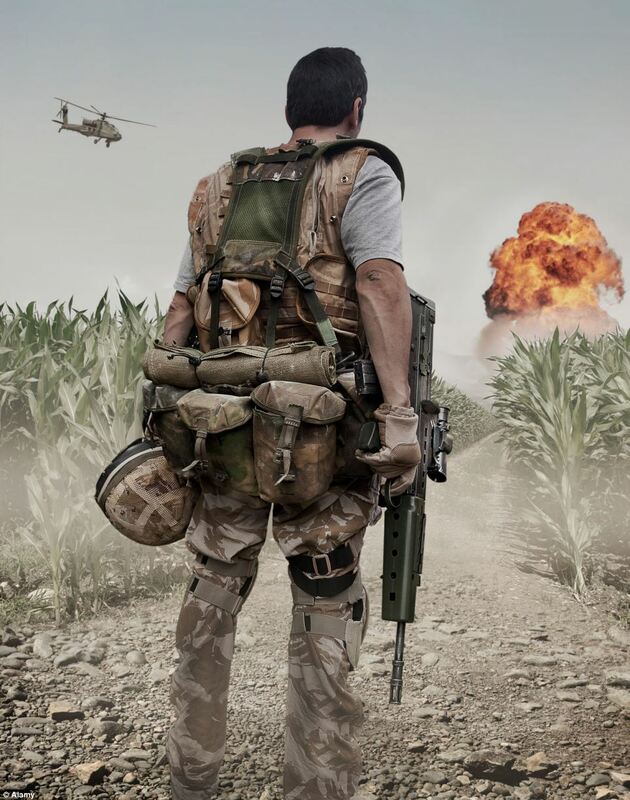 Science fiction: What seems like science fiction today could soon become a battlefield reality if technology being worked on by Ministry of Defence boffins sees the light of day. The breakthrough has been made by Dr Miguel Nicolelis, a neurobiologist at Duke University in North Carolina, who announced earlier this year that he had given rats the ability to detect infra-red light, normally invisible to them, by fitting them with an infra-red detector wired to microscopic electrodes in their brains. The military are interested in super-blood, too. Surgeons and emergency doctors have long hoped for the advent of artificial blood that can safely be stored for months or years, and be given to any patient. Now that possibility is nearing reality, thanks to the work of British teams such as those at the University of Sheffield. Chemists there have created a ‘plastic blood’ that mimics red blood cells and can be successfully donated to over 98 per cent of patients. Military scientists are predicting a wealth of potential breakthroughs in human capability that could be created by advanced future versions of artificial blood. For example, nanotechnology could fill them with synthetic platelets, the naturally occurring cell fragments vital for clotting, enabling wounds to heal faster. Artificial blood could also be adapted to increase its power to carry oxygen and nutrients round the body, thus boosting muscle and brain power. But artificial blood would not be the only way to muscle power. Back in 2004, Lee Sweeney, a geneticist at the University of Pennsylvania, showed it was possible to create genetically modified mice that produced a natural stimulant in their muscles called ‘insulin-like growth factor’. 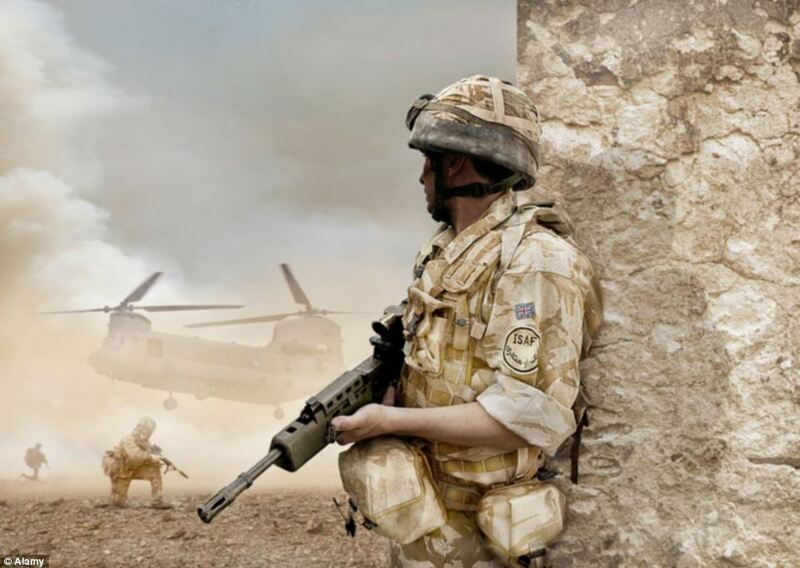 Some of the finest minds are working away on military technology which could transform the British soldier into bionic superhumans, according to newly released documents. Mice with such enhanced genes had more than 30 per cent stronger muscles, enabling them to run for much faster and longer than normal. Dr Sweeney’s mice were modified as embryos. Since then, genetics researchers have been working on ways to boost muscles in adults. In 2008, scientists at the University of Pennsylvania created GM mice that could run six times further than normal without suffering from exhaustion, by altering a gene called interleukin-15R alpha, which shifts how energy is used in the ‘fast-twitch’ muscle fibres that provide sprinting ability. Such breakthroughs promise to create armies that appear unbeatable. The Pentagon is now working on manipulating human brainwaves to optimise performance. American military chiefs are seeking a technology system that would synchronise gamma waves (which facilitate memory creation) and theta waves (for turning short-term memories into lasting ones), so they work together in the best way. This would boost the ability of soldiers to retain lots of information in high-stress situations, for longer. Telepathy is being considered as well — and already a machine has been developed in Dr Nicolelis’s laboratory to make it happen, facilitating telepathic communication over distances of thousands of miles, though so far only for rats. The implications for the military are extraordinary. If commanders could simply pass on their thoughts to their troops without the need for radios, it would confer a huge tactical advantage. Given the extraordinary pace of technological development, one thing is certain — the toughest man in the Armed Forces could soon be the one with a silicon chip on his shoulder. Human “Super Soldiers” have been here for over 40 years. Not in space, though…Almost all my blogs are related in one way or another to papers or books I’m writing. Today’s supersoldiers are the forerunners to what is to come. This is one of the reasons I was writing the papers; it’s ‘super’-important that we wake up — as many people as possible — or this supersoldier theme will have a tragic ending (see “The Third Level of Learning”). What is exposed in this article is as usual just the tip of the iceberg. The real technology is far in advance from this, but also way behind from what is going to be used in the more faraway furture. There will be a day — not far from now — when people in general will think that supersolders are just as natural as everything else, and then it’s harder to convince people that it’s an agenda behind it.